Last week's blog article focused on the many storage solutions available at Designer Sofas For You. Sticking with the theme of maximising your potential living space with our help, our article this week is all about Chesterfield sofa beds, of which we have more than 175 different styles in stock. And, best of all, order soon and you can save a massive 50% on the RRP! This is our signature sofa bed, manufactured using materials of premium quality such as non-tropical hardwood and classic Old English leather. Semi-aniline, the leather used to create the Era 3-Seater Chesterfield Sofa Bed is tanned to give an aesthe­tic­ally-pleasing aged finish and is treated with extra fat liquors to deliver a waxy, tactile feel. Each hide is completely natural, meaning that every sofa is absolutely unique. There is an eclectic palette of 16 Old English leather colours to choose from when you purchase the Era 3-Seater Chesterfield Sofa Bed from Designer Sofas 4 U. 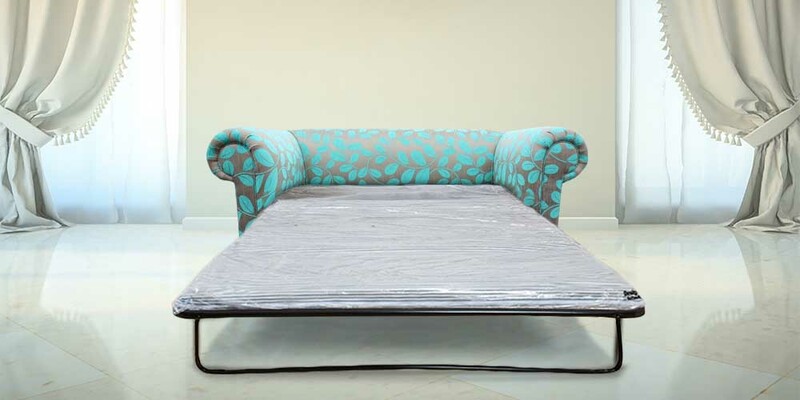 Each sofa bed is supplied as standard with a 12-month manufacturer's guarantee and a 10-year framework guarantee. For additional peace-of-mind, an additional 5-year warranty is available. Rendered in delightful velvet fabric and printed all over with turquoise orchard leaves, this stunning Chesterfield sofa bed is a visual treat that feels just as good as it looks. 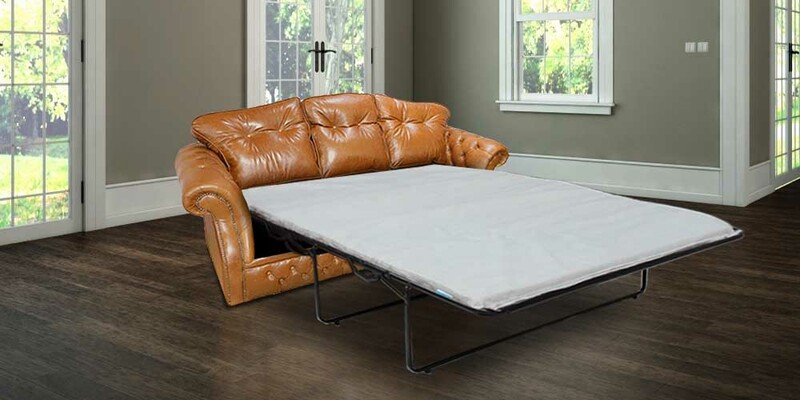 The handmade piece features all the classic Chesterfield design elements, including a low back, deep-buttoned upholstery and scroll-fronted arms. Discover the full collection of Chesterfield sofa beds here on the Designer Sofas 4 You website and order soon to take advantage of our half-price offer!